If you find yourself in Alberta, Canada amongst the mountains and the long straight roads that go on for miles, wondering what else should be on your list of sights to see and things to do, experiencing the West Edmonton Mall should be on it. The size of a city block, boasting a whopping 5.3 million square feet, and housing around 800 stores, this mammoth building is fun for the whole family. You could probably take a few days to walk around North Americas largest mall, with all there is to see. The mall holds records for largest parking lot, largest indoor lake, largest wave pool, largest triple loop roller coaster, and the largest indoor amusement park. And if that’s not enough to impress you, you can also find over 100 dining options and one of a kind retail stores. The list truly does go on and on. When you find yourself too tired to shop anymore, one of the two hotels on sight will pamper you and give you your much needed rest. The Fantasyland hotel, which is on a list of the top 10 most unique hotels worldwide, is a luxury hotel, with 235 rooms decorated in a classic style, and 120 fantasy themed rooms that were designed with s specific place or era in mind. A few fun examples of these rooms are; Western Theme, Hollywood Theme, Roman Theme and Space Theme. However, if this seems a little to quirky, and possibly a little to expensive for your taste, then the West Edmonton Mall Inn offers a more casual experience, just minutes away from more hours of shopping and fun. As you find yourself wandering, and quite possibly lost, you may come upon a large, beautiful, ship. 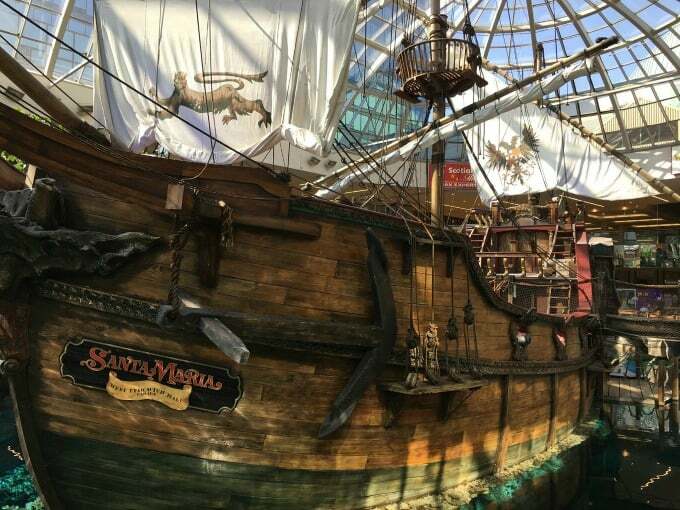 This is the Santa Maria, an exact replica of the ship that Christopher Columbus sailed on his infamous 1492 voyage across the Atlantic Ocean. Close by this, is the fun and interactive Marine Life show, with daily live presentations. 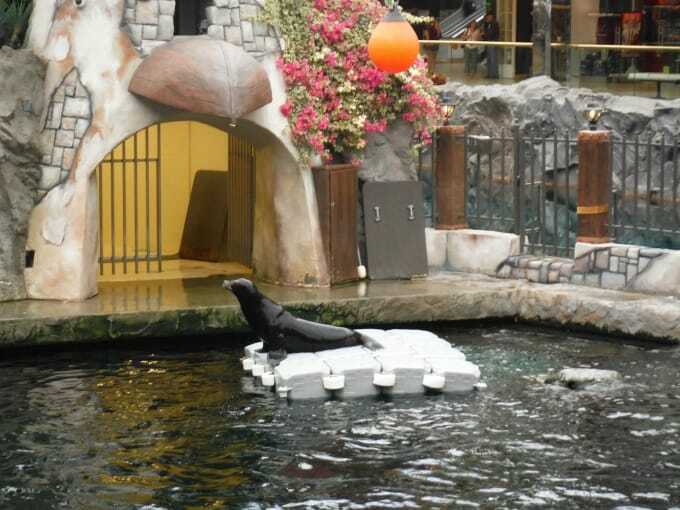 You can watch the sea lions slip down slides and entertain the audience of all ages. If you still haven’t got enough of these interesting creatures, Sea Life Caverns is an underground aquarium, with more than 100 species of sea turtles, fish, sharks, reptiles, amphibians, penguins and more. If you find yourself wishing you could be swimming and splashing around just like the marine life, head over to the World Waterpark to do just that. You can frolic in the wave pool, with the tropical 31 degree temperature keeping you warm, or take a turn on one of the many slides found in the worlds largest indoor wave pool. With ample room and lots of chairs to sit and relax, you could easily spend the whole day in just the water park. And finally, a tour to the West Edmonton Mall, is not complete without a trip to the Galaxyland Amusement Park. 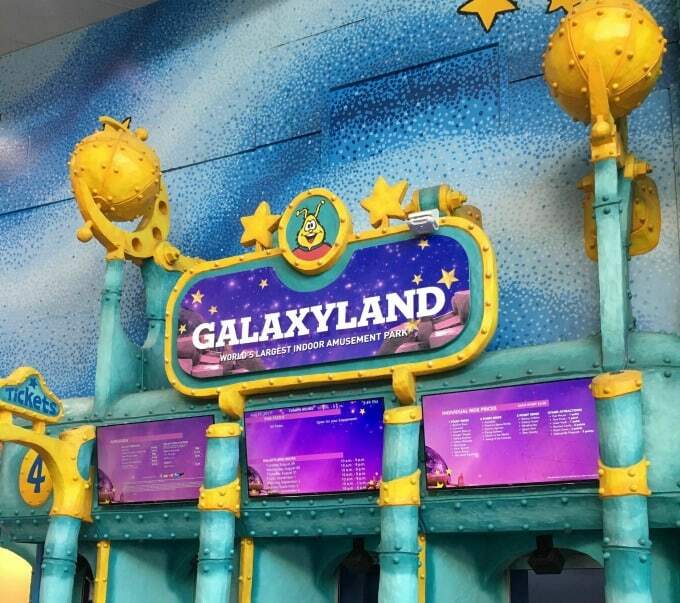 Boasting 27 rides in this indoor amusement park, Galaxyland is fun for the whole family. From roller coasters, to carnival games and a beautiful merry go round, it’s sure to bring a smile to everyones face. If you plan to add this one of a kind mall to your list, make sure to bring comfortable shoes, lots of water, and factor in at least a full day to explore. And if you find yourself lost in the fun and excitement of the West Edmonton Mall, maybe leaving a trail of breadcrumbs back to your car isn’t a bad idea. Angel is the co-creator of two girls, a devoted wife, a proud Canadian Veteran, a free spirit, and a self-diagnosed travel addict. She divides her time between her family, travelling, reading, writing, photography and getting her hands on anything chocolate! The edmonton mall sounds amazing. Looks like a fun place to spend those long, cold winter days. It has been 24 years since I last visited West Edmonton Mall. Such a wonderful place back then and even more so now. We lived in Edmonton when it first opened and there used to be so many great kiosks and fun things to do that aren’t there anymore. It’s still a favourite place to go when in Edmonton as we love the waterslides and it is undeniable that there is a CRAZY amount of stores, but I miss a lot of the stuff that was there when it opened.